My newsletter readers (you do know I have a newsletter, right? Another one’s going out later today: sign up here!) went nuts last week when I shared a picture of my friend Brian’s red beans and rice and didn’t offer up a recipe. “Can you get the recipe?” one replied. “Where’s the recipe?” wrote another. “You owe $15,000 in back taxes,” wrote the U.S. government. I e-mailed Brian and he said he couldn’t help with the taxes but he’d gladly write up a recipe. A while back, Brian had mentioned that he wanted to make red beans and rice for me someday. I thought to myself, “Well that’ll be nice.” I had no idea it was going to be such a flavor extravaganza. But Brian pickles his meat three days before; he uses Tasso, which is cured pork; there’s also andouille sausage. The end result is so bursting with flavor, anything else you eat for the next week or two will simply pale in comparison. It’s powerful stuff. Here, then, is Brian’s recipe in Italics. Thanks to Brian for taking the time to type it up! 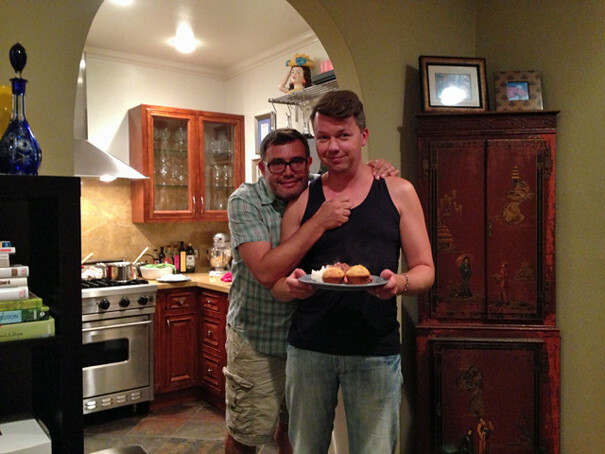 Oh and also for making it for us because it was totally delicious. Some elements of this recipe are very traditional (like pickle meat), however the recipe uses more meat than most recipes would. Red Beans and Rice is cheap food for a crowd or large family, so most of the time people wouldn’t have been so lavish with the ratio of expensive meat vs. cheap beans. If you want a more classic version, just cut back the pickle meat and tasso and mash up some of the beans toward the end of your cooking time to release some extra bean starch into the water. The end result will be a more creamy sauce. It’s good either way. If you use less pickle meat add a slug of vinegar toward the end of cooking to add some acidic brightness. First you have to make some pickle meat (unless you live in Louisiana and can buy it in the store). All measurements are guesstimates. Combine everything except the ice and pork in a saucepan and boil, and then simmer for 5 minutes . Remove from heat. Add enough ice to get the liquid chilly. Put the liquid in a freezer bag with the pork, remove excess air from the bag, and put the whole thing in a big bowl so piggy pickle juice won’t leak all over your fridge. Let the meat pickle in the refrigerator for three to five days or so. This makes enough for three or four batches of red beans, depending on how meaty you like your beans, so when you take the meat out of the fridge just put whatever you aren’t going to use in two or three Ziploc bags and freeze them. Make sure to rinse all of the peppercorns off of your pickle meat before using it. •	Andouille sausage (as much as you want). The Andouille can either be sliced and put into the beans a few minutes before serving, or you can cut the sausages lengthwise, cook in a skillet, and serve on the side. Again, I like Savoie’s brand. Aidelle’s brand Andouille, while widely available in supermarkets, tastes almost nothing like Andouille. I think it’s too bland. The night before you want to make red beans and rice, make brine in a large bowl. Just dissolve about a third of a cup of salt in a gallon or so of water. Let the beans soak in the brine overnight. 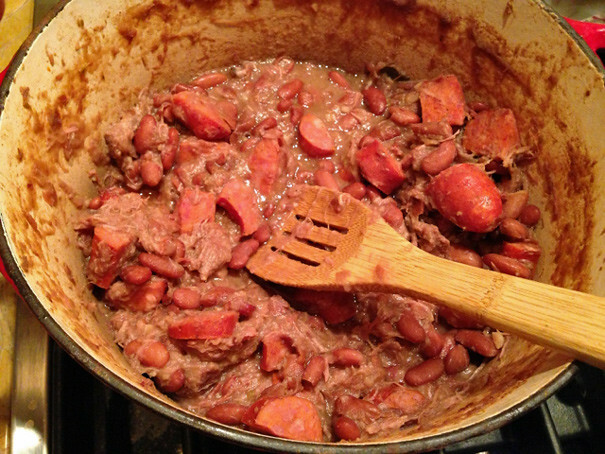 About three or four hours before you want to serve your red beans, warm up a sturdy Dutch oven over medium high heat. Melt some bacon grease (probably a tablespoon) and then cook the Tasso in the bacon grease for a couple of minutes. Cut the pepper, onion and celery into chunks, then chop them up in the food processor into small bits (we don’t need a precise chop here, the vegetables are going to almost dissolve anyway so nobody would ever get to appreciate your fancy knife work). Add the vegetables to the bacon grease and Tasso, let them sweat for five minutes or so, but try not to let the vegetables brown too much. Add the garlic (either minced or run through a garlic press) and cook for 30 seconds until it is fragrant. Add the pickle meat (anywhere from 4 oz to 8 oz). Add the chicken stock, bay leaf, water and the beans. Bring to a boil. Reduce heat to maintain a pretty decent simmer. Stir every once in a while. After an hour or so, taste the broth. Add hot sauce if you like. After about three hours the meat should have basically melted. Now is the time to add more hot sauce or salt, to taste. You can also loosen the sauce up with a little water if you like. I usually pilaf the rice, but you don’t have to. Making it by the package directions is fine. 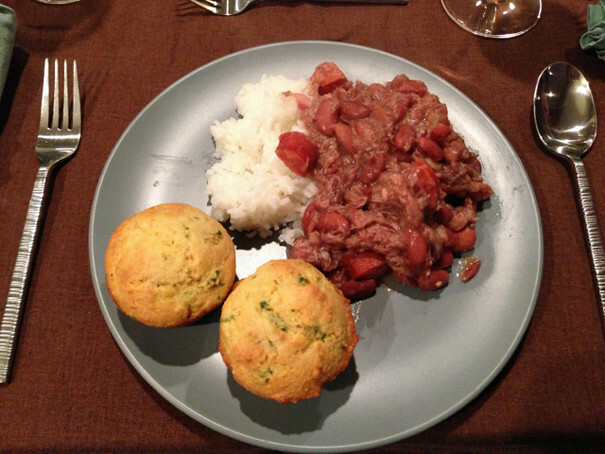 Serve the beans over the rice, preferably with some cornbread.